Wish you all a great Diwali. Happy cooking. I am looking forward to reading all those great posts. This month JFI has Jackfruit as the star and it is hosted by Jai and Bee. I love jackfruit, obvious isn't it... I especially love the green, unripe kind as a vegetable. I usually make it Kerala style with lots of coconut. This time I decided to try a new way as a Biryani. I used frozen green jackfruit. For this recipe, I think the frozen ones are sturdy. The canned kind would turn into a mush. For this JFI, I made Kathal biryani and Elai adai. I had never imagined anyone else using green jackfruit except Keralites. But from so many recipes that are available, I know I am wrong on that. The biryani actually tastes so much like a Chicken biryani. Jackfruit is quite meaty in texture when cooked. Cut the jackfruit into slices. Peel and cut into cubes. Wash and soak rice. Parboil the rice with a little sea-salt and half of the whole garam masala (cardamom, cinnamon, cloves). Drain the parboiled rice and keep aside. Heat sufficient oil in a kadai and deep-fry the jackfruit cubes. Drain and keep aside. In the same oil deep-fry half the sliced onions till golden brown and crisp. Drain and keep aside. In another pan heat two tablespoons of oil, add shahi jeera and the remaining crushed whole garam masala. Add the remaining sliced onions and sauté for a while. Add ginger paste, garlic paste and continue to sauté. Add turmeric powder, cumin powder, coriander powder, red chilli powder, chopped tomatoes and continue to sauté for two to three minutes. Add the fried jackfruit cubes and stir. Add yogurt, sea salt and chopped coriander leaves. Dissolve the saffron in lukewarm milk and keep aside. Preheat the oven to 350 F. Take a large casserole, arrange half the jackfruit mixture. Over this spread a layer of rice. 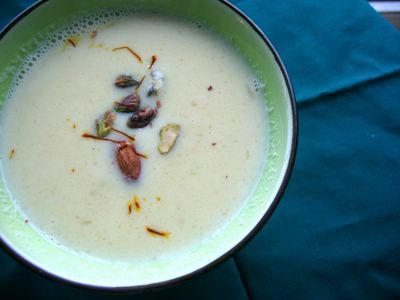 Sprinkle saffron milk, garam masala powder, mint leaves (torn),. Then repeat these layers once again. Top it with fried sliced onions and mint leaves. Cover with aluminium foil and cook in the preheated oven for about 20 to 25 minutes. Serve hot with a raita . I also made Ammupatti's elai adai. Her way of making it is similar to my mom's. I used store-bought rice flour and roasted it without coloring the flour. I also used thawed frozen banana leaves available in Asian grocery stores. It tastes so good warm with the fragrance of banana leaf. You can also make it with parchment paper but nothing to beat banana leaf. The filling is some delicious chakkai varatti. Another dessert I love with jackfruit is chakkapradhaman. You can make chakkapradhaman in two ways- with jackfruit varatti or without. Check out my recipes here and here. Making the jam in microwave is much easier than making it on stove-top!